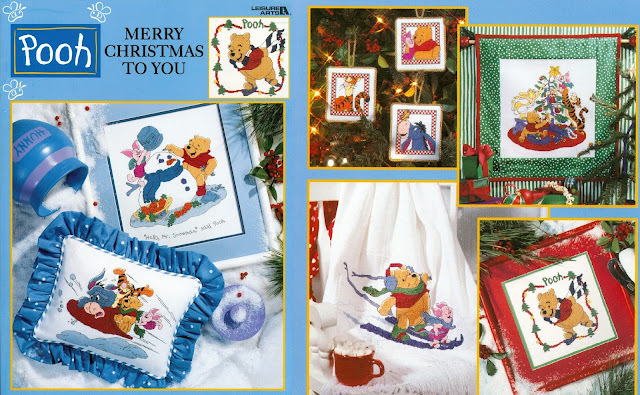 The Pooh Merry Christmas to You cross stitch book is a must have for any pooh lover! If you love to cross stitch and you love Winnie the Pooh, Eeyore, Tigger and Piglet, then you will definitely want to add this cross stitch pattern book to your craft book library. This is a softcover book that features 8 color patterns for pictures, plus 4 color patterns for ornaments. You can stitch the gang sledding in the snow together, or decorating a Christmas tree. Each and every pattern is adorable! There are several cross stitch patterns of individual characters that are absolutely delightful too. There is one of a gift laden Tigger that is totally fabulous and an ice skating Pooh bear that is quite charming. The finished project photos alone will inspire you to create beautiful works of cross stitch art. As you can see in the photos, you could use these patterns to make a pillow, an afghan, a hanging quilt style blanket, or pictures to frame, in addition to the Christmas tree ornaments. They are all Christmas themed patterns, but you will be tempted to leave them out year round. There are several, like the skating and sledding pictures, that could easily remain a part of your home decor during the entire winter season. Now, don't tell anyone, but I leave mine out year round. It is, after all, my home and I do love Pooh! I'm sorry, but this item is currently sold out! 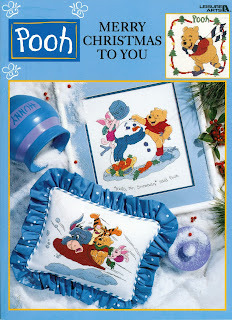 In addition to the Pooh & gang cross stitch patterns, there are basic instructions on how or make and finish each of the projects you see in the photos. If you don't own a sewing machine, you could purchase a pre-finished afghan or perhaps a hand towel made just for cross-stitching. NOTE: I'm sorry, but this item is currently sold out! Please visit the House of Sylvestermouse eBay Store to View Available Embroidery Kits. How adorable. Pooh is one of my favorite characters. He's the sweetest bear in the world. And his friends are equally as sweet. Who can resist them! Pooh Christmas and cross stitch - what a great combination! While I enjoy Pooh Bear and the whole gang, my daughter is even crazier than I am about them. So this gives me a perfect gift for her! Thanks for the wonderful pattern book.